This Roll of the Dice is a nice choice for a beginner quilter. 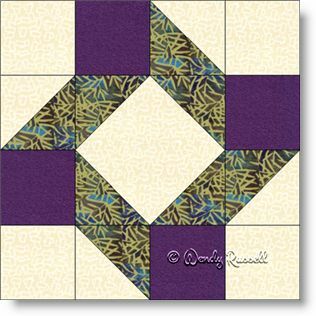 It is easy to construct and introduces two common quilt patches -- the half square triangle and the square in a square patch. Although this block is technically a four patch (so named as it is designed on a 4 x 4 grid), with the changes I made to the pattern, it is now constructed as an uneven nine patch.